Google Analytics provides a great tool that everyone should take advantage of. It’s called Goals. Setting up goals for your website will give you a better idea of where and how users are converting from readers to prospective clients or customers. You want to know what channels are working to convert your users and which channels are not; the Goals tool will tell you whether your first step toward success came when a reader completed a contact form or instead downloaded a report. I will be walking you through how to set up Goals in Analytics. However, keep in mind that this is not a perfect metric. Google Analytics can miss goal conversions for a variety of reasons, so this number won’t exactly match what you may see in DSS or any other lead generation tool you use. It is still very useful and can help you understand what marketing efforts are working best. What Are You Trying to Track? There are a lot of different actions users can make on your website that you can track using Goals in Google Analytics. You can create goals based on the individual pages that users visit; on the path they took through the website; on engagement metrics, such as bounce rate and average visit duration; or even on specific events. 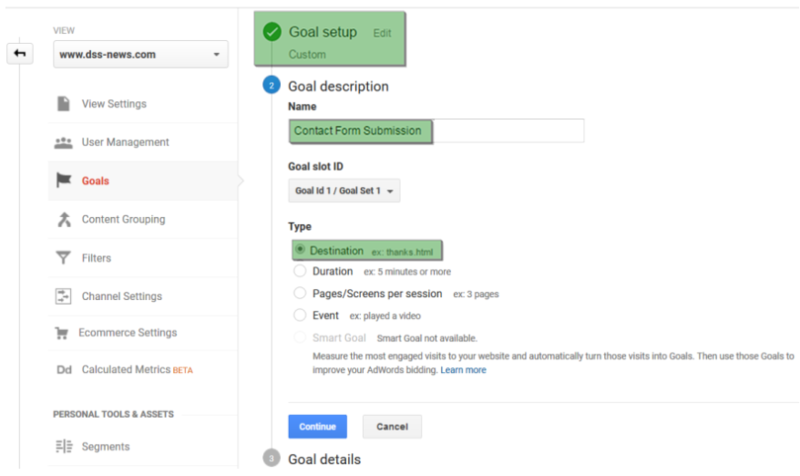 In this blog post, we are going to talk about how to track contact form submissions with Google Analytics Goals. These goal conversions are going to tell you the origins of clients who reached out to you. Click “+New Goal,” select a “Custom” goal setup, and click “Continue.” I will be calling this goal “Contact Form Submission,” but you can name yours Goal Conversion or whatever makes sense to you. The goal slot ID will default to your next available goal slot, so there is no need to change this. Keep in mind, you can track only 20 goals in Google Analytics, so be careful that you are only creating goals that make sense to track. One good note: if a goal you have created is no longer serving your needs, you can redefine it at any later time. Now we are going to choose the actual details for this goal. For a contact form submission, you want to make the destination equal to whatever the page is that your visitors are sent to after they have verified their form submission. If you are a Foster Web Marketing client, this is going to be /thank-you.cfm unless you are using a unique thank-you page. Before you set up the goal, complete a test contact form submission on your website. You are going to only use whatever comes after the domain; for example, use /thank-you.cfm instead of lawfirm.com/thank-you.cfm. If you have an idea of how much each lead is worth to you, then you can add a monetary value to your goal. Finally, you want to click “Verify this Goal” to make sure the goal is set up correctly. However, you’ll only know if it worked if someone completed a contact form submission within the last seven days. 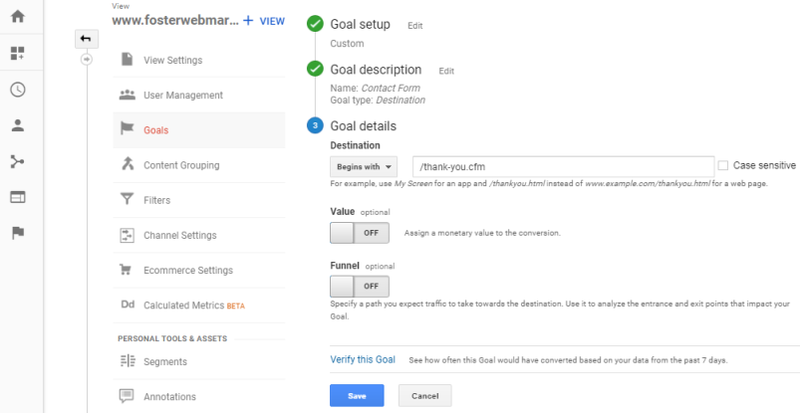 Where Can You See Goal Conversions in Your Google Analytics? A lot of our clients have free offers and book downloads on their sites as another type of conversion. Tracking these conversions is a little different once you actually begin setting up the details for these goals. First, if your website is through Foster Web Marketing, the thank-you page is now going to be /reports/thank-you.cfm unless you are using a custom thank-you landing page. Again, do a test by downloading your book or requesting the free offer on your website, and see what page users are actually sent to after verifying their contact information. Second, if you have multiple offers on your website, you are going to use the funnel section this time. You are going to use the report page as the funnel because users must go through that page to get to the thank-you page. Now, you will be able to tell where users came from when they download your books or request free offers. But don’t stop here! There are a lot of other goals you can create in order to track events like chats and other interactions. Get creative in creating your goals and tracking your marketing efforts. If you are having difficulties creating goals for your website, please contact customer service by calling 888-886-0939. We would enjoy the opportunity to help you better track the success of your marketing program.